Night Vision Exposes Safety Sign Flaws! Apr 13, 2014 Paying the price, in more ways than you think! Think safety signs are all the same? Think again. You might be exposing your organization to unwanted liab..
Stop indicates the right of way for drivers on the approaches to an intersection, or for pedestrians at a crosswalk. 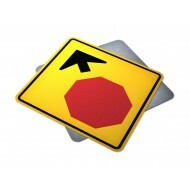 A standard size of a Stop sign is 60 cm x 60 cm. This is the minimum sign size permitted on the provincial highways. 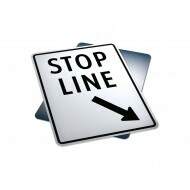 Your existing stop signs might be out of date? Type III or IV is no longer the acceptable sheeting for primary use. Reflective Sheeting for Provincial Highways must be Type IX or Type XI. 310-SIGN only uses the highest grade reflective, Type XI on all regulatory Stop Signs. 90cm x 90cm • Two-lane major highways. 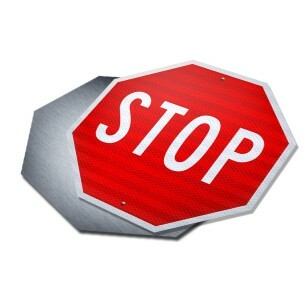 • Used as an oversize sign at major and minor intersections (on all roadway classes), based on the warranting criteria (for oversize Stop sign warrant see the following section). 120cm x 120cm • Used as an oversize sign at major and minor intersections (on all roadway classes), based on the warranting criteria (for oversize Stop sign warrant see the following section). • Installed only as an enhancement when other measures have failed. 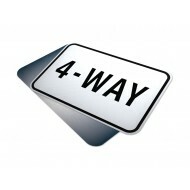 150cm x 150cm • Used as an oversize sign at major intersections only (on major highways), based on warranting criteria (see the following section). • Installed only as an enhancement when other measures have failed. A 1500 mm x 1500 mm sign should only be reserved for higher classes, high speed roadways. 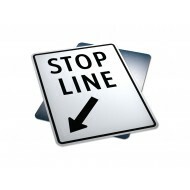 Purpose: Stop Line (On Left Of Sign) is a miscellaneous regulatory sign which indica..
Purpose: Stop Line (On Right Of Sign) is a miscellaneous regulatory sign which indic..